The seas are rising fast — and even faster in Mass. 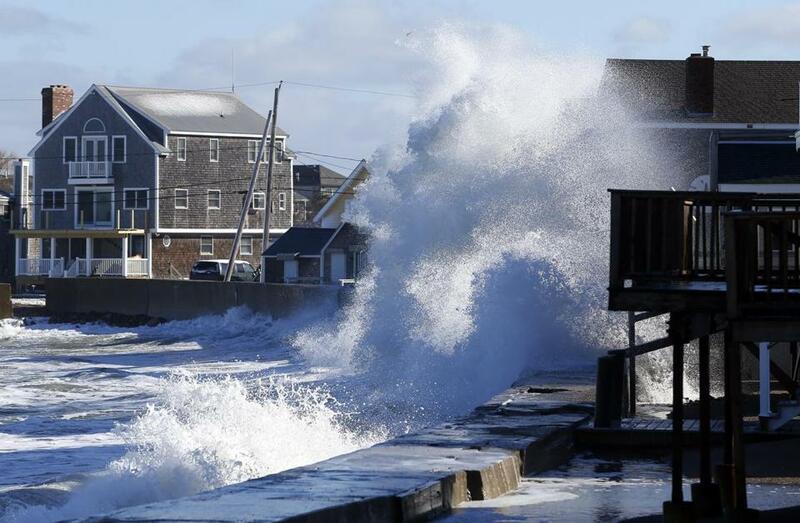 Waves crashed against the sea wall last month on Lighthouse Road in Scituate. A new study released this week found that the world’s oceans rose significantly faster last century than in any of the previous 27 centuries. It also showed levels increasing even faster along the East Coast, including the shores of Massachusetts. Researchers say they expect sea level rises in our region to continue to outpace other parts of the world. “There are reasons to think Boston and other areas of New England and along the East Coast will continue to see greater relative sea level rise than the global average,” said Andrew Kemp, an assistant professor in Tufts University’s Department of Earth and Ocean Sciences. “We know there are a lot of processes that are going to make it a lot worse here than other parts of the world,” he added. Kemp and another area researcher, Jeffrey Donnelly of the Woods Hole Oceanographic Institution, in recent years helped study and collect data about how sea levels have risen along the shores of Massachusetts and Connecticut. Read: Is winter over for Boston? Their analysis, along with research by another local scientist, Harvard geophysics professor Jerry Mitrovica, was included in a study published Monday in the Proceedings of the National Academy of Sciences. That new study, which made headlines, calculated that the global sea level rose by about 5.4 inches between 1900 and 2000. Scientists say the sea level rise is being caused by global warming melting the polar ice caps. At three sites where data has been tracked in Massachusetts, the sea level rise was higher. In Barnstable, there was an 11.1-inch increase in sea levels in the 20th century, the study found. In Revere, the water rose 9.3 inches. At Wood Island, it increased by 8.8 inches. Three other sites in Connecticut all saw sea levels rise by more than 10 inches. The largest increase was 15.2 inches at a spot in New Jersey. Other parts of the Garden State as well as spots in North Carolina also saw increases larger than the global number. The findings are similar to previous research that has found sea levels to be rising faster along the East Coast than in other parts of the planet. So why has the ocean swallowed more of the shorelines here? “The ocean isn’t a bathtub. It doesn’t rise equally everywhere,” Kemp said. One key factor is that we’re sinking. “On the East Coast of the US, the biggest change [until about 1850] was that the land was going down rather than the sea going up,” said Kemp. He explained that the massive sheet of ice that covered Canada during the Ice Age was so heavy that it caused the land below it to be pushed downward, which triggered a rise in land in other areas, including New England. As ice from the Ice Age melted, it reversed that process, and it’s still not done. Kemp said land here is still sinking at a rate of about 1 millimeter annually and we can expect that to continue for at least the next 1,000 years. “The process goes on for thousands of years even after the ice melts away,” he said. Another factor responsible for sea levels rising faster here than in other parts of the world is a slowdown in the Gulf Stream in the Atlantic Ocean. The Gulf Stream creates a “hill” of water in the Atlantic Ocean that’s roughly parallel to the shores of the East Coast. But the Gulf Stream has been slowing down, causing the hill to flatten out, leading to higher sea levels along the Eastern Seaboard, said Kemp. A third factor is the melting of ice at the top of the world, including places like Greenland. A large ice sheet has a strong gravitational pull and as it melts, it not only adds water to the ocean, but the ice sheet also loses mass. That loss of mass weakens the ice sheet’s gravitational pull, causing water to flow away from it, experts say. “Boston has a lot more to fear than Greenland, which of course is counterintuitive,” said Kemp. The study released this week — which was largely in line with other recent studies on the topic — also projected that by 2100 global sea levels will rise by anywhere from another 11 inches to another 4 feet 4 inches. The increase will depend on how much greenhouse gas emissions, which scientists say cause global warming, can be reduced. 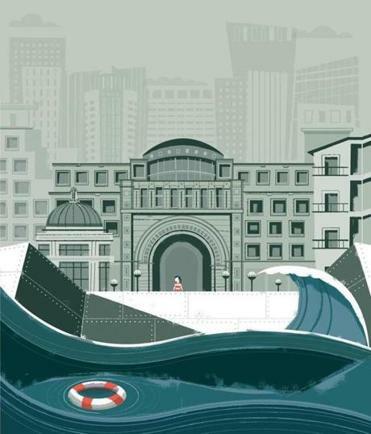 Concern over rising sea levels has spurred cities around the world into action. Senator Edward J. Markey, a Massachusetts Democrat, said more must be done to cut back harmful emissions and to prepare for the effects of global warming. “Because of climate change, Massachusetts is already experiencing sea-level rise and stronger storms that flood homes and businesses,” he said in a statement. In Massachusetts, state and local officials, utility companies, and others have taken steps to try to prevent and prepare for impacts from potential flooding, including efforts to shore up coastal areas and dams, review building codes, and measure what would happen to tunnels and other infrastructure under flood conditions. He pointed out that much of the state’s population and infrastructure is situated near the ocean. Pruitt said his organization is one of several urging political leaders to bolster efforts to plan for the future. Estimates compiled for a recent study show parts of New England saw particularly sharp rises in relative sea levels. Global sea level rose by about 5.4 inches between 1900 and 2000, the study found.